Well what a wash out yesterday was. It rained and rained and then threw some more rain in for good measure. We've had a blocked drain pipe just outside the back door for a while, but the drip drip drip from it drove me bonkers yesterday so out came the ladder and I finally cleaned it out. No more drips but I was one soggy girly by the time I'd finished. Andy looked on in amazement from inside the house telling me I really did pick my moments lol!!! We trundled as far as Homebase to get a new light fitting for my work area. got soaked again and came home lol!! It was soooooo busy. Definitely a DIY day for all. Hopefully Oli will fit it today. 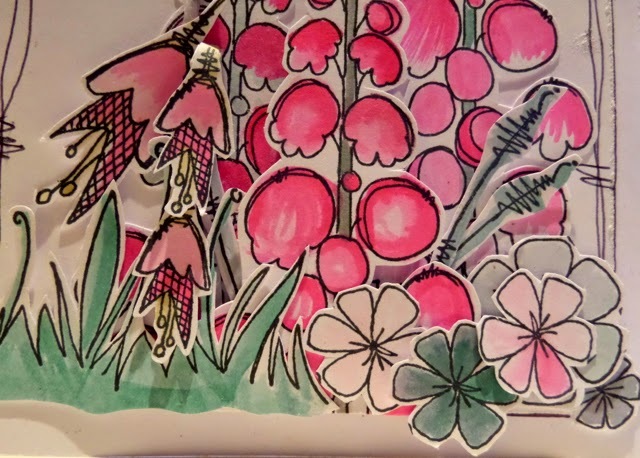 My card, now on its way to my Aunt for her birthday was stamped with more JOFY stamps (Shelia thought I was having a JOFY phase as I added another set of stamps to my basket at Pink Tulip on Saturday, and I think she was right lol!!) I love them, and they're great for colouring with Copics and inks. 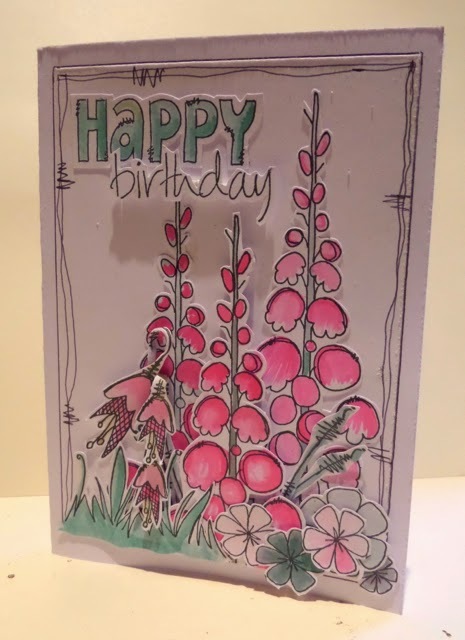 I've used Stamp sets Minis 21 and 34 and collection 26 for the flowers, and water coloured the images with Picked Raspberry and Ice Spruce Distress Inks with a hint of Crushed Olive on some of the stalks. All the stamped images were cut out and decoupaged onto the base card for a dimensional effect. Morning Clare, This card is lovely, your Aunt will adore it. I really love the dimension you have got, and the flowers look stunning. We had the very same weather here yesterday and today is not as bad but still drizzly and dank, yucky !! Tomorrow is supposed to be much better, fingers crossed haha, bring back the sunshine I say !! its a beautiful card Clare. Morning (in my case) Clare, though it happens to be 2:37 p.m. where you are!!! Love the little card, am sure your Aunt will love receiving it as well!! We were to get a storm in last night and today, hasn't happened so far, hope it holds off til I get down to the valley!! I am always so inspired by all that you do and I thank you for sharing your talent with us! I laughed when you said Andy was watching you clean out the gutter from inside the house!!! Good for you but he should have had tea waiting for you!!!!!! Apologies for not being around of late but have had family visiting and had no time to sit and enjoy all your beautiful projects. Now they have all gone I've finally managed to get some "me" time and have been catching up with all your news. I have to say I love all of the projects you've posted of late, and I particularly liked the tent card. Just beautiful. I have to say your weather report reads like ours although we do have beautiful sunshine at the moment! Good to read that your pipes are now all clear and in good working order (nothing personal - although it's always good to know that you have a second skill to fall back on. lol!) Thanks for sharing your wonderful work and I hope you enjoy the rest of your day.